Carson Model TD-042 ED. Illustration courtesy of Carson Optical. Carson Optical (www.carsonoptical.com) is a supplier of binoculars, magnifiers, microscopes, telescopes, spotting scopes and rifle scopes. 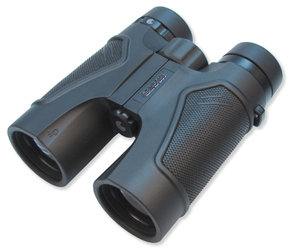 The 3D Series ED Glass Binoculars are Carson's top of the line binoculars. I tested the TD-042 ED model binocular, which is new for 2012. The 3D Series ED Binoculars are great, but the accessories that come with them are so cool that I’ve got to mention them first. The innovative BinoArmor binocular case, which was introduced by Carson Optical in 2008, is for serious binocular users. The BinoArmor case is a lightweight neoprene cover that wraps around the binocular, using magnetic fasteners to close. The binocular can be worn around the neck in the case and the case opened in an instant, silently, by parting the two flaps. There is no Velcro-tearing or zipper-sound. This feature can be important if observing wildlife. A wide, elastic strap inside holds the case to the binoculars while viewing. Or, you can simply remove the case from the binoculars. There are pockets on either side of the case for holding small objects, such as Carson Lens Cleaners. Carson sells their BinoArmor case separately, if you need a great binocular case. The binocular comes with a ("Kuban Hitch" type) carrying harness that goes over both shoulders, under the arms and behind the neck, holding the binocular snugly to the chest. The harness attaches to the binocular with plastic clips, which can be somewhat difficult to open. The harness straps are 1” wide, heavy-duty elastic and the tension from the elastic adds stability when using the binocular. The straps are adjustable and quite comfortable. When wearing the binocular attached to the harness, the case can still be used. There is also an included neoprene neck strap that allows the binocular to hang freely at waist level. The 3D Series 10x42mm ED Binocular is solidly constructed and feels good in the hands. It is slightly shorter in length than other 10x binoculars with 42mm objectives I have used. It is made with a rubber-coated aluminum body that incorporates a textured center section and thumb-grooves on the lower inside. All parts have a smooth rubber coating, except for the diopter adjustment ring. The attachment hinge is at the center and is a single, five-element, barrel hinge. The hinge operates smoothly, with just enough resistance to hold the binocular at the chosen inter-pupillary distance. The focus adjustment is at the back of the hinge. The focus wheel is a convenient size and easy to focus with one finger; there is no take-up slack. The eye cups are a twist-up design, with a detent that holds them in the upright position. 3D Series binoculars are O-ring sealed, waterproof and fog proof. The TD-042 ED's basic features are typical of modern 8x and 10x magnification binoculars. The significant feature that sets this binocular apart in its price class is the use of ED (Extra-low Dispersion) glass in its objective lenses. There are various grades/types of ED glass, but Carson Optical (like most binocular manufacturers) does not specify exactly what glass they are using in their ED binocular elements, so I cannot be more specific. ED Glass provides two optical benefits: better color registration and less light dispersion. With conventional crown and flint glass achromatic objectives, each element focuses the various wavelengths of light to a slightly different point. This is what causes color fringing, a rainbow effect around an object’s edges in certain lighting conditions. ED Glass dramatically reduces color fringing, resulting in semi-apochromatic imaging. It took me several days to find conditions where color fringing was visible with this binocular, and I was specifically looking for color fringing. If I were just using the binocular on a normal basis, it would have been unnoticeable. The TD-042 ED will serve amateur astronomers and other critical observers well. For a viewing comparison, I used a dense stand of bamboo that was 100 feet away and extended into the blue sky. The bamboo provided many different colors, shadows and contrast. The first thing I noticed is this Carson ED binocular put all three of my personal (non-ED) binoculars to shame. I couldn’t justify comparing it to what I had, so I borrowed ED binoculars from other staff members. The TD-042 ED demonstrated very good color saturation, brightness, contrast and resolution, even in the shadows and low light areas. When compared to other brands of ED binoculars, all with higher retail prices, I could discern no visible difference between this Carson ED Binocular and the higher priced brands. I am an amateur birder with a modest life list of 231. However, I have never been a dedicated bird watcher; all of my observations are done in the course of other activities, such as hunting, fishing, astronomy, RV’ing and motorcycle riding. Binoculars have always gotten in the way, so they usually get left behind. However, with its great case and harness, I can carry the Carson TD-042 ED while participating in other activities. I can wear it under my jacket when riding my motorcycle and I only have to unzip my jacket to use it. This binocular won’t be left behind. Copyright 2012, 2016 by Rocky Hays and/or chuckhawks.com. All rights reserved.